Readers Jenn C. and Chuck H. from Dorchester, Massachusetts, recently sailed on Norwegian’s Norwegian Dream. You can read about their experiences in today’s blog entry. If you’d like to tell your fellow readers about a cruise you’ve taken, please answer the questions in the format below and email them to me at cruise@smartertravel.com. We sailed a seven-night “Texaribbean” itinerary leaving from and returning to Houston. The ports were Progreso and Cozumel, Mexico; and Belize City, Belize. There was one sea day before Progreso and two sea days on the way back from Belize to Houston. What did you like most about the onboard experience and why? The staff and crew were always helpful and accommodating. For a seven-day cruise with 1,700 passengers, a surprising number remembered names and preferences before the end of the week. Because it is an older ship from a less popular embarkation port, it was relatively inexpensive, but we had everything we needed. We enjoyed the luxury of feeling like we were “eating out” every night, with a number of options for live music and other entertainment, both before and after dinner. What did you like least? Why? Because the ship is older and was stretched, some of the physical layout is a bit awkward or in the realm of “can’t get there from here,” but that is a trade-off we adjusted to. We disliked the extent of territoriality people had over saving lounge chairs and that the decks were frequently out of towels. How would you rate your cabin? Our promenade deck cabin was relatively spacious, with a nice sitting area separated by a curtain from the bed area. The bathroom was very small but made good use of the available space, including well-placed glass corner shelves that held most of our toiletries. The bed was very comfortable and firm, though the two twin mattresses did separate occasionally. The window was large and the view was good, but it was partially obstructed in the upper third by the lifeboats that were hung above the promenade (though it was not an “obstructed view” cabin). The window did appear to be effectively tinted, providing privacy from the joggers and walkers outside. The food was quite good. We mostly avoided the buffets, but had reasonable experiences at them when we went for snacks or breakfast. There is only one up-charge restaurant on the Dream, Le Bistrot. We went once and had a wonderful evening; it was well worth the $15 per person fee. Our favorite everyday restaurant was Terraces, at the rear of the ship. The food there is the same as at Four Seasons, the other main sit-down restaurant. While service was attentive in both restaurants, we found that at Four Seasons our plates were whisked away as soon as they were empty and replaced with the next course, leaving us little time to enjoy the meal or the view. At Terraces we had some space between courses, which was much more to our liking. The only real disappointment with the food was the desserts. They were consistently mediocre and Chuck in particular had very bad luck with crusts. The Chocoholic Buffet was a bit better but still not fantastic, although it was visually stunning. The two-foot tall chocolate chess knight was particularly impressive. 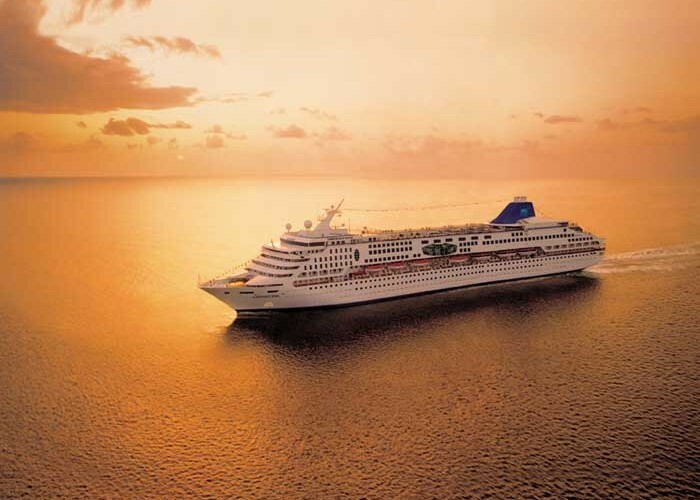 What was your favorite port or shore excursion and why? It is tough to choose between Cozumel and Belize City for different reasons. In Cozumel we went on a well-run ship-sponsored excursion to go reef snorkeling at the Palancar Reef. We were taken from the port on a catamaran by a friendly excursion crew out to the reef site, and accompanied in the water by two dive masters. There were too many people on the trip due to merging two separate excursions, but they still had enough equipment for everyone. We saw a sea turtle and a stingray, along with many fish. The coral was in good shape; in that area it is limestone colored instead of pink, but still interesting to look at. In Belize we went with an independent cave-tubing-excursion company, Cave-Tubing.com. They were incredibly energetic and friendly, making sure that all of the kids on the trip got chips, and advising everyone to get fully wet to stay cool for the jungle hike to get to the caves. The caves themselves were impressive to see, but we could have had a little more time to see specific formations. It was made clear to us that the people who were really dawdling were not on cruise ships, and we appreciated the commitment to getting us back to the ship on time given that there’s no guarantee the ship would wait for an independent excursion. At half the price of the ship’s equivalent excursion, but with such amazing staff, you should definitely use them if you are in Belize. What was your least favorite onshore experience? Why? The “Flamingos and Mayan Ruins 4×4 Eco-Adventure” was fun, and a fine way to spend our first shore day, but not what was advertised or what we would have chosen had we known. There was no justifiable reason to use the little rickety, ill-maintained beach buggies, as all our driving was on major roads. In fact, a tour bus was parked next to us at the ruins. The ruins were interesting to see, but there was no organized information at the site explaining its significance, and one got the sense that our guide was a little unsure on the specifics himself. And, in the nearby salt flats, there were no flamingos. It was explained to us that this is not really their season, which makes it a little annoying that the excursion is still offered with that title. It is one thing to not guarantee flamingo sightings, but another to advertise them at a time of year when they are simply not around. The group added a 90-minute beach break at the end in compensation, which was nice, but not the same as having the chance to make fully informed choices for ourselves at the start. Would you sail with this cruise line again? Yes. We do not feel committed to them above all others, but if other things were equal we might choose them based on familiarity and good experience. We are curious to see what one of the newer, larger ships would be like.